On June 25, 2005, Darin Berdinka and I climbed the SE Face of “Silver Horn”, a prominent spire of the Silver Star Massif. The quality of the route far exceeded our expectations, with 700 feet of fine granite splitter cracks and corners and only 100 feet or so of Washington Pass “funk-litter.” In keeping with the spirit of the area, we chose to call our route “The Chalice.” It was a quest of self-realization into a land of mystery for a magical vessel, and now we have something from which to drink all that wine! Green Creek Arête. © Darin Berdinka. On July 1, 2005, Allen Carbert and I traversed into the Green Creek drainage and after an hour of thrashing broke out along the bank of the creek. This wild spot has great views of the Green Glacier to the west and Mount Baker and Lincoln Peak to the east. After crossing the creek we headed up the enormous talus slopes that define the upper regions of this drainage. One east-facing wall stood out, steep, clean and bordered by an impressive, gendarmed arête. Four hours after leaving the car we stood near its base. Intimidated and running short on time, we decided the arête would be a perfect choice for the day. Like many routes in the Sisters, the climbing was much easier than it looked. We scrambled up delightful third- and fourth-class rock before slipping into rock shoes for a clean, exposed slab on the crest of the arête. 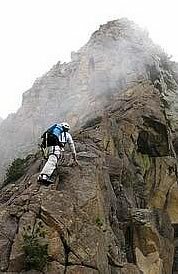 The horizontal section turned out to be exciting third-class scrambling right along the massive drop of the east face. We roped up for a 100-foot pitch of 5.6 cracks on more clean, solid rock before a final bit of scrambling led to...nowhere. The arête simply ended on a minor high point of the long ridgeline separating the drainages of the Green and Sisters Glaciers. We built a small cairn and ate lunch while enjoying the unique views of the Sisters Glacier which looked to be no more than a 45-minute walk away. We had chosen to carry over and decided to descend by heading east along the ridgeline. After cresting a highpoint marked “5,179ft” on maps, we headed down through open meadows then more thick forest. At 3,600 feet we took a hard right, dropping back into the Green Creek drainage. A steep descent led to an even steeper gorge where we once again crossed the creek before climbing back up to the trail. Eight-and-a-half hours after leaving we were back at the car, satisfied with a great day in the local hills. 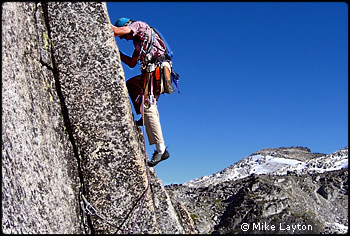 On July 10, 2005, Rolf Larson and I climbed a new line up the 1,500-foot Boola Boola Buttress in the Dragontrail Plateau. The first three pitches offer spectacular and steep granite crack climbing. The middle section leaves much to be desired, but the upper headwall once again offers steep, challenging climbing. Spectacular scenery! On July 16 and 17, 2005, Sam Avaiusini, Hannah Carrigan, Phil Fortier, Jason and Josh Hummel, and I approached a 9,100-foot camp between two lobes of the North Mowich Glacier on Mount Rainier. Early on the morning of July 18, we started across the south lobe toward the Central Mowich Face. Five of us carried skis, while Hannah did not. Intestinal problems stopped one skier shortly above the bergschrund. About 1,000 feet higher, three others decided to stop, concerned about the icy state of the early morning snow. Hannah and I continued up the face and through the 1967 upper-right variation, making running belays using pickets from just below the variation until the face eased below Liberty Cap. The variation required, at most, a handful of steps on the front points of the crampons. I can’t imagine the face in better condition for a ski descent. We were atop Liberty Cap about 11:30 a.m. Hannah started down the Disappointment Cleaver route while I considered the Mowich descent. With direct afternoon sun, 3:00 to 5:00 p.m. probably would have been the ideal time for the descent. But the breeze was mighty cold and I wanted to rejoin my friends below the face, so I started down. I really should have waited longer for the snow to soften. I skied from the summit of Liberty Cap to the upper Edmunds Headwall. The snow on this portion, which hadn’t given me pause on the ascent, was not holding an edge nearly as well as I’d hoped. Every turn ended with several feet of skidding. I noticed a chute on skier’s right, about 50 degrees and as wide as my skis. I thought it was a climber’s-left exit to the 1967 variation. I stowed a pole and grabbed an ax to make the entrance. One turn that took about 15 feet of skidding to stop put me in a good position to sidestep through the chute. Sidestepping complete, I made a turn on the open slopes below the chute before I noticed that I was perched above big cliffs. OK, I was not on the variation, being too far to skier’s left. Luckily, I was able to traverse out of my predicament. Once on the headwall again, I was right next to the true variation. I eased my way to its edge and switched the ax to my right (uphill) hand. Just a short, icy traverse would put me on the Central Mowich Face, two thousand exhilarating feet above deliverance. A moment’s contemplation and I pushed over the edge. Keep your weight centered. Feel those edges! Thankfully, the edges held. I skied the next thousand feet rather tentatively. Decompression took awhile. The snow eventually changed to corn and I enjoyed the lower part of the face, returning to my friends and our camp. We packed up and headed out that afternoon. On July 19, 2005, Darin Berdinka and I climbed a six-pitch 5.10 route of steep crack climbing on bullet-hard glassy olivine within spitting distance of Bellingham. The mythical Bellingham big wall was finally discovered! This route is destined to become a local classic. The setting, in the Green Creek Valley of the Twin Sister Range, is absolutely gorgeous—reminiscent of the Sierras. Amazing backcountry skiing opportunities exist in this little-known gem of a valley. On July 30, 2005, Eric Gamage and I completed the Direct North Face of Big Four’s most prominent tower. The route likely shares upper pitches with the Miller/Guydelkon 1971 route. In 2004, Stephen Packard, James Lescantz and I began investigating a steep slab on the north face which in recent summers has been dry enough to be climbable. Generally, the climbing is on extremely hard conglomerate, with excellent face climbing in equal ratio to sinker hand/fist cracks. Overall, 2,500ft of climbing is required to reach the summit of the tower. The middle of the tower has about 300 feet of bushwhacking to overcome. When dry enough to climb, the route will not have water. Approach using the Ice Caves Trail, contouring east to the chasm separating the first and second towers. Go downhill about 200 feet, and look to access a bench below obvious steep slabs above. Two hundred feet of fourth class zigzags reach the start of the first pitch. Pitch 1: Somewhat flared but fun chimney/fist crack. 150ft, 5.8, gear to 4in. Nice belay ledge. Pitch 2: Steep and grooved headwall with consistent 5.8+ moves for nearly 155ft, draws. Semi-hanging belay at 2 bolts. Pitch 3: More steep slab with interesting huecos and strangeness at 5.9+ or .10a, 150ft, small TCUs, pink tri-cam, and draws. 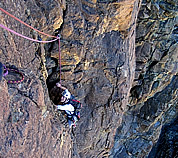 Belay at good ledge. Pitch 4: Work up and right over a bulging slab with bolts (5.7). 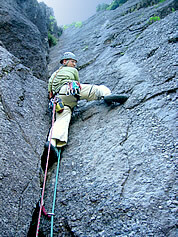 Run-out 5.5 leads to a cedar tree ledge at the base of a thin fingers dihedral. 70ft. A #2 LoweBall protects the initial moves well. Pitch 5: Nice 5.8 dihedral steps right to the arête after the crack runs out. Bolts and thin gear lead to a prominent off-width pillar crack (5.7+). 145ft, gear to 4in. Belay at a 2-bolt station on sloping ledge. Pitch 6: Amazing 5.8 hand crack for 75ft. Belay at a large cedar with slings. Pitch 7: Fourth class up and left through blueberries to reach an easy chimney notch. Belay at tree with slings. This is "1 Acre Ledge". Move the belay up and right 100ft to a cave. It is advisable to rope packs up here, rather than spelunking. Once through the cave, go up the vegetated, yet delightful gully (3rd/4th) for around 300ft. Pitch 8: Blocky face and chimney climbing accesses the spacious ledge below the upper slabs (5.7). 4-inch gear helpful. Pitch 9: A few unprotected face moves reach another great hand crack. Move left to a 2-bolt belay when crack runs out, 150ft. Pitch 10: Staying near the crest, a low-to-mid-fifth arête is climbed to a cedar bush with slings some 150ft out. Pitch 11: Working right, follow features to a unique 5.4 wide crack complete with chockstones. Step left, and over small roof to belay at a nice ledge with cedar, 150ft. Pitch 12: Follow white slabs within 30ft of chasm view. Belay at small tree with slings 150ft up. Hike up into the fields, or step left for great views of Sloan Peak. Scramble for about 10 minutes, using ramps to access the area below the summit spire. Pitch 13: On the west face of the spire is an excellent and somewhat hidden 5.8 hand crack. Rap sling in place. Descend the route. Slings/anchors in place. 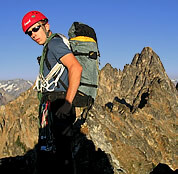 On July 31, 2005, Rolf Larson, Dan Capellini, and I climbed an eight-pitch route up a tower in the Enchantments. Along the approach up Aasgard Pass lies a 1,000-foot tower that blends into the skyline until you're right under it. The tower is across the pass from the NE Face of Dragontail. We climbed steep unrelenting cracks for six pitches to an à cheval ridge with absolutely spectacular exposure to the top of the pinnacle. On August 9, 2005, Tim Halder and I climbed the mile-long East Ridge of Tupshin Peak to the summit. This prominent line had not been climbed, although Tupshin Peak is among Washington’s 100 highest peaks and plainly visible from many surrounding summits. The ridge included many gendarmes and initially consisted of a variety of third-, fourth-, and low-fifth-class climbing with significant exposure. From a camp above the town of Stehekin at 6,300 feet, we simul-climbed roughly two-thirds of the distance before belaying a remaining ten pitches of harder climbing to the summit. The rock was loose in places but had good corners and blocks as well. Once on route, turning around or descending either side would have involved building anchors for multiple rappels, and no comfortable bivy spots were encountered, so moving quickly was important. We were roped up for eight hours before the summit, and we descended the East Face in two 60m rappels and some fourth-class down-climbing.